This 182-minute Indian coproduction sags in parts, but ultimately triumphs thanks to a kinetic energy. The accuracy of Kapoor’s statement comes into sharp focus about two hours into the 182-minute feature, as the action-comedy-adventure Disney co-production hurtles us from Purulia and Ukhrul in India, to Moombaka and Shundi in Africa, and we begin to feel increasingly overwhelmed as we try to work out exactly how we got from place to random place. Basu’s exceedingly ambitious storytelling vision is the kind that most creatives in Bollywood might never even dare (let alone carry out), but it’s a double-edged sword responsible for the film’s most memorable moments, but also for often losing grasp of the narrative — and the audience — along the way. The first half of the film is a slow, but engaging, introduction to Jagga: an orphan born with a debilitating stutter, adopted at a young age by the enigmatic “Tutti-Phooti” (a fantastic Saswata Chatterjee). Jagga’s new father figure urges him to sidestep his impediment by singing instead of speaking his words, setting into motion one of Basu’s most daring stylistic choices: a lead character that delivers his dialogue solely through rap or song. Tutti-Phooti’s strategy buoys Jagga with newfound confidence, and the two form an eclectic yet heartwarming relationship, until mysterious circumstances force Tutti-Phooti to enroll Jagga into boarding school, where he spends the remainder of his adolescence. When Jagga doesn’t receive his usual birthday present from Tutti-Phooti in the mail one year, he senses trouble and sets out to find his beloved father. Before long, he comes across clumsy-but-courageous journalist Shruti (Katrina Kaif), and enlists her to help him in his search, tipping the film into a second half of high-powered, continent-spanning capers as their simple quest turns into a frantic effort to thwart illegal arms dealers, evade spies and simply stay alive. On one hand, “Jagga Jasoos” gives us much of what we often complain is missing in mainstream Indian films: novel ideas, fearlessly unique execution and performances rooted in something deeper than the actors’ perfectly sculpted frames. 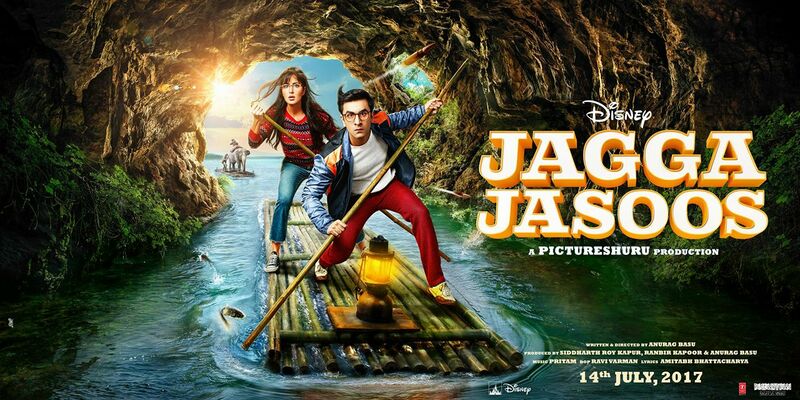 Basu creates the unusual and stylistically risky universe of “Jagga Jasoos” with commitment and conviction, particularly when it comes to borrowing from the western musical format. While the regular Bollywood filmgoer may be accustomed to actors suddenly and inexplicably breaking into song and dance, this is no usual Hindi musical; here, the musical elements are less a break from the narrative and more an integral part of it. It takes a good chunk of the first act to get used to the constant sing-songy dialogue delivery, but the whimsical accompanying score by Pritam and clever lyrics by Amitabh Bhattacharya do wonders to lure us into a world where rhyming verses are the norm. Jagga and Shruti’s crime-solving antics have a cartoonish rhythm that’s reminiscent of both Sherlock Holmes and Tintin, designed to delight children as well as nostalgic adults. Richly saturated visuals make everything from the mountain villages of Manipur to the deserts of Africa appear as though they’ve been lifted straight from the pages of a comic book. Meanwhile, Kapoor inhabits Jagga like he’s been the character his entire life; despite being way too old to play the schoolboy, he slips into the role with the childlike spirit and heart-tugging naivety it requires, proving his sparkling talent yet again. While Kaif’s on-point comic timing is a pleasant surprise, she struggles to match Kapoor’s energy. It’s actually Chatterjee, as Tutti-Phutti, who’s Jagga’s real other half, their rapport forming the heart and soul of the film. So it’s disappointing that the bolder Basu becomes with his stylistic elements of his story, the less control he seems to retain over its emotional core. The beautifully established father-son bond of the opening half gets lost in an exhausting second act cluttered with entirely too many detours and action. The film quickly begins to feel like a theme park attraction as Jagga and Shruti spin on ferris wheels, ride ostriches through African plains, raft across rivers, stow away on speeding trains, become the unwitting targets of car chases and more. Basu also unnecessarily peppers in real-world issues and events like international terrorism and the Purulia Arms Drop of 1995, the additions of which seem both underdeveloped and forced. Though there’s hardly a dull minute, it’s still hard to stifle multiple yawns when all the gallivanting and tangents get confusing and, consequently, test our patience. Endearing but exhausting, imaginative but indulgent, “Jagga” gives us countless individual moments to love, but they struggle to come together in a focused narrative. And yet, it’s mind-boggling and awe-inspiring to fathom the many logistical mazes that must have been navigated to produce this extravagant adventure. Where visuals, tone and treatment are concerned, Basu has given us a film unlike anything we’ve seen in recent Indian cinema, proving, if nothing else, the endless possibilities of a boundless imagination.